Soups that increase your Calcium, Veg. Soups that increase your Calcium. high calcium soups. Soups are a lovely way to start the meal. Not only do they temper your tummy, but also make room for some friendly conversation before concentrating on the main meal. Here are some nutritious and appetising soups, which are calcium-rich too. From creamy shorbas to chunky broths, we have strived to offer you a vast range of options with vegetables like broccoli and sprouts, as well as unique ingredients like kidney beans and whey, which will not only warm your heart but also perk up your bones! Try our Low Cal Spinach Soup which is made with low fat milk. For weight loss or Pregnant women we suggest Nourishing Moong Soup. Then there is the Spinach Paneer and Dal Soup made with low fat paneer for those wanting to loose weight. Then there is the Protein rich curry soup called Msaoor Dal Paneer Soup. Broccoli benefits in bone health as it contains Calcium which promotes strong bone growth and prevents osteoporosis. Choose from broccoli walnut soup, broccoli soup recipe and broccoli broth recipe. Enjoy our collection of Soups that increase your Calcium. 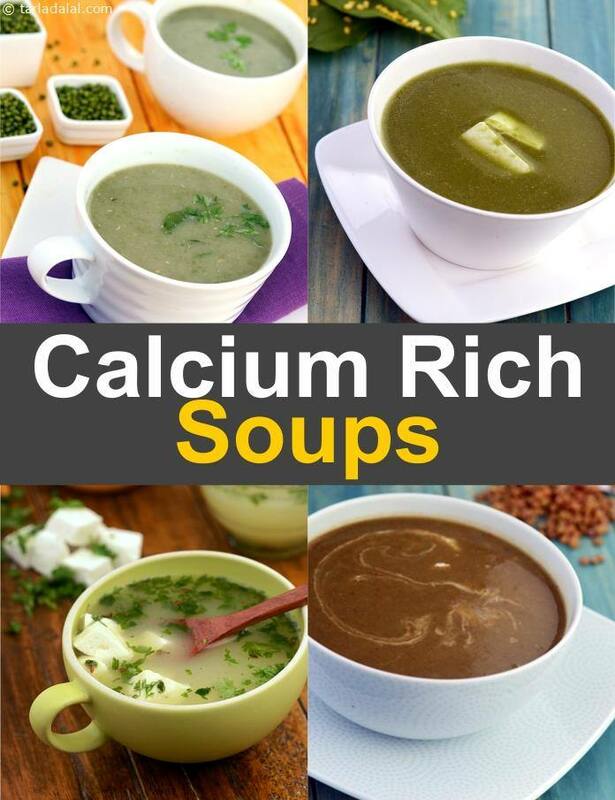 high calcium soups given below from Calcium Rich Breakfast to Desserts.